Brought to you by Nodma, this printable from SAP Learning Math Book 1 will help students practice subtraction by crossing out, counting on, counting back, and using number bonds. 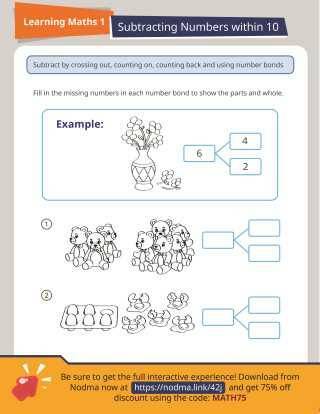 Using the illustrations on the worksheet as a guide, students will be asked to ﬁll the missing boxes with numbers that make up the equation. Students will need to count on, count back and subtract all or part of the illustrated objects of the equation to get the correct answers. Teaching Tip: Model the activity for the class by asking the class how many students are present that day, how many are absent, and what is the total number of students in class. After students complete the worksheet, ask them to give the total number of family members they can count at home, and ask how many of those cited are adults and how many are kids. This resource aligns to CCSS.MATH.CONTENT.1.OA.C.5, the 1st Grade Common Core Standard for measuring lengths. Total is 10: What's Missing?